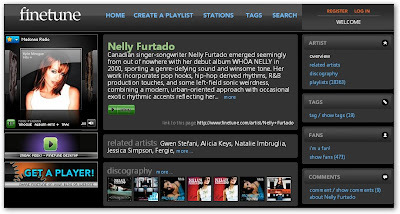 Finetune lets you create a playlist of music that you can share on your blog or MySpace profile. Like Pandora and Last.fm, it also adds a dash of personalization to recommend other artists to you based on the ones on your playlist. First enter an artist's name to bring up a listing of tracks and albums. To add one of the 2 million free tracks in the Finetune database to your playlist, you click the orange plus button next to each track. You can add up to 45 tracks to a playlist, but if you're lazy, you can always press the "I'm Lazy!" button to have Finetune fill out a playlist for you. The digital music service has embraced a viral marketing strategy by combining personalized webradio with a music player widget that can be embedded anywhere. This is something that Last.fm has only recently started doing. Overall, Finetune has an appealing interface that combines free music with easy playlist sharing and popular accessories like radio edits and album art that should prove attractive to the teen music listening demographic.